Join us for a screening and discussion about the impact of displacement on people’s lives. Greek-Armenian artist Aikaterini Gegisian presents three short films looking at how identities are informed by a sense of place and belonging as well as displacement and exile. Following this, we discuss how those seeking refuge are shown in images used by the media and NGOs, and how people would choose to represent their own stories. All are welcome to speak and listen in this informal event. Please sign up by contacting Helen Wickens on Helen.Wickens@tees.ac.uk or 01642 931232. This event launches the third part of a season of screenings of work by Gegisian. Throughout December, we show two recent documentaries and a new audio-visual collage. Gegisian’s Passengers (2007) documents members of the Greek-Pontiac immigrant community living in Thessaloniki, Greece. They narrate their personal stories over imagery of deserted neighbourhood streets. 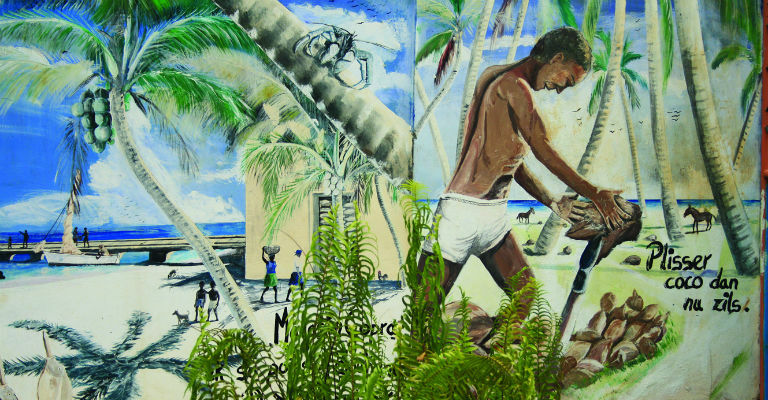 Diego Garcia (2010) looks at the deportation of inhabitants of the Chagos Islands in the Indian Ocean to Mauritius. It combines extracts from Chagossian High Court testimonies with a journey through the Mauritian scenery.